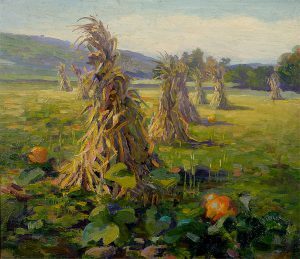 Marion Smith Attended Emporia State Teachers College, 1893; University of Nebraska, 1893; Pennsylvania Academy of the Fine Arts, Philadelphia, 1898; and the Art Institute of Chicago, 1903. Later periods of study in Minneapolis, Chicago, and Woodstock, New York, and again at the Pennsylvania Academy. During 1899-1902, she traveled and studied throughout South America – Chile, Uruguay and Brazil. Appointed to the faculty at Nebraska Normal School, Kearney, 1905; matriculated, Kearney State Teachers College, 1926; received BFA degree, 1932; retired, 1943. Marion was particularly known for her portraits of Indian subjects made on trips to the Rosebud Reservation in South Dakota.